E.R. RAMACHANDRAN writes: There are many ways of celebrating Mysore being ranked No. 4 on the list of the must-see places in the world by the New York Times. But can any of them come close to the spectacle of the finals of the nation’s premier domestic cricket tournament being held in our midst? The finals of the Ranji Trophy, in this the 75th year of the tournament, between Karnataka and Bombay, will be played in Mysore for the first time. Besides the picture postcard venue—the beautiful Gangotri Glades Grounds overlooking a lake against the backdrop of the Chamundi Hills—there is an additional surprise: this is the first time the finals of the tournament is being held away from the homeground of the host sides in 12 years. What swung the venue in favour of Mysore was Rahul Dravid. The Karnataka captain, who along with Sachin Tendulkar will miss the match as they will be in Bangladesh doing duty for the country, thought the Mysore pitch offered ‘pace and bounce’ to the young Karnataka pace bowlers—R. Vinay Kumar, Abhimanyu Mithun and S. Arvind—who between them have bagged over 100 wickets this season. 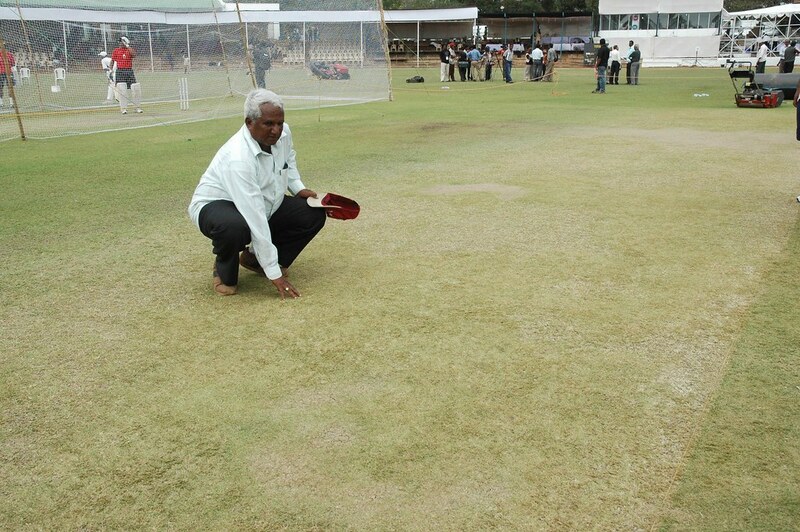 Therefore, Karnataka preferred to play at Gangotri Glades rather than the M. Chinnaswamy stadium in Bangalore. As the Karnataka State Cricket Association’s pointsmen in Mysore—chairman Sunaad Raghuram, secretary Satyanarayana Nadig and convenor R.K. Harikrishna Kumar, and C. Krishna of the University of Mysore—prepare the pitch and oversee all the exacting arrangements that go with hosting a Ranji final, I remember a couple of anecdotes connected with the Karnataka (then Mysore) Ranji team. Not too many know that Mysore figured in the first ever Ranji Trophy match played on November 4, 1934. It was a typical monsoon day with the sky heavily overcast and one day was all it took for Madras to beat Mysore by an innings and 23 runs. Morapakkam Joysam Gopalan better known as M.J. Gopalan, the double international who represented India in both hockey and cricket, bowled the first ball in the tournament; left-arm spinner A.G. Ram Singh captured six for 19 and C.P. Johnstone four for 10 as Mysore batting first on a rain-affected pitch collapsed for 48; five players scored zeroes. In Madras’ reply of 130, only four batsmen attained double figures, Cota Ramaswami (another double international, who played Test cricket and Davis Cup tennis) top scoring with 26. Offbreak bowler M.G. Vijayasarathi (who later became a famous international umpire) captured six for 23, and Shafi Darashah, in whose name a schools’ tournament was later played, bagged three. Mysore, facing a deficit for 82, failed again, this time for 59! Ram Singh dismissed half the side for16 while Gopalan claimed three for 20. The story is told how some people, who had gone to the Bangalore city railway station to read The Hindu newspaper coming from Madras for the cricket news were surprised to see the Mysore team getting down from the train. They must have got the news of the match first hand and in greater detail from the players themselves! This is for the first time and only time perhaps the only time a Ranji match was over in one day after having commenced at 11 am, the game lastig a little over 100 overs!Gopalan and Ram Singh were the quintessential Madras cricketers of this generation and in time became living legends. Ram Singh’s sons A.G. Kripal Singh and A.G. Milkha Singh too went on to represent the country. Cota Ramaswami attained fame in a different sort of way. He went for a morning walk and never returned and was never found. If alive, he could be the oldest living cricketer today! The details of this match, held in Rahul Dravid’s place of birth, were narrated to me by B.K. Garudachar, a member of the team who played Ranji for Mysore in the 1940s and ’50s. Mr Garudachar was staying in Mysore colony in Chembur, Bombay, when I met him in 1980. “Holkar won the toss and started batting. We never knew the kind of leather hunt we were in for. Holkar played for two and a half days and destroyed our attack to score 912 for 8 wickets declared. Six of the first eight Holkar batsmen scored centuries with Mushtaq Ali who rarely ever failed, being caught and bowled for 2! “Wicketkeeper K.V. Bhandarkar (142), Chandu Sarwate (101), M.M. Jagdale (164), C.K. Nayudu (101) , B.B. Nimbalkar (172), R.P Singh (100) scored centuries. C.S. Nayudu missed out but scored 70 and odd runs. “I felt, if we had run all the way to Bangalore we would have reached earlier than the time we took running around the field fetching the ball from the boundary! I took 4 wickets, B. Frank 1 and K.P. Ubhaykar 1. “We were all out for 190 in our first Innings with Chandu Sarwate claiming 9 wickets for 61 for Holkar. “Following on, we scored 509 in the second innings and gained some self- respect. I scored 164, Frank scored 80. I will never forget that match”. P.R. Shyamsundar, elder brother of P.R. Ashokanand, the current vice president of KSCA, did not have a good match, He scored a zero bowled by Sarwate. Y. S. Ramaswamy, in whose name the YSR shield is instituted, also failed with bat and ball in that match. Who can forget the thrilling final when Karnataka chased Bombay’s first innings score of 534 after losing 6 wickets for 293 in the 1983 finals? Roger Binny made 115 and A.V. Jayaprakash 89. But still there was a mountain to climb. That was when numbers 8, 9 and 10 in J. Abhiram (69), Ranjit Kanvilkar (32 ) and B. Vijayakrishna (42) contributed handsomely . When Karnataka was 526 for nine still 8 runs short, and time for chewing the fingernails, it was left arm spinner and current selector A. Raghuram Bhat who held his nerve and stayed with Vijayakrishna till they overhauled Bombay’s 534! What a thrilling finish it was worth befitting a final! Kanvilkar, a budding all-rounder at the time, was tragically killed in a train accident. I am sure there will be a thrilling encounter, as always, between two of the best teams in the country, with no quarters given or taken. I hope Karnataka will lift the Ranji Trophy for the first time at the Gangotri Glades in Mysore. That will be a fitting festival gift for fans for Sankranthi. JAVAGAL SRINATH: The only “good” commentator around? Is State’s success in cricket and economics linked? This entry was posted in Cricket, Etcetera, Kannada & Karnataka, Mysore-Bangalore and tagged Brijesh Patel, C.K. Nayudu, Churumuri, Gangotri Glades, Karnataka vs Bombay, M. Chinnaswamy Stadium, Manasagangothri, New York Times, Rahul Dravid, Ranji Trophy, Sachin Tendulkar, Sans Serif, Sunaad Raghuram, The Hindu, University of Mysore. Bookmark the permalink. Mysore is not No. 4 on the list of the must-see places in the world by the New York Times. It is No. 4 on the list of the must-see places in the world by the New York Times in 2010. Did you see this story in Mid Day? Mumbai players feel the ground is no good. They seem to acting like the Aussies. Or might be getting ready with excuses if they were to lose to the host team! This is a splendid memorial by ERR. Let’s find a Kannada name for “Gangothri Glades.” It is time we got away from our Anglophilia and K. V. Puttappa’s perpetual romance with Samskritha. If we already have a Kannada word for something, why borrow from other languages? “Maanasa Gangothri,” “MangaLa Gangothri” and “Jnaanabharathi” sound hideous to me. Why do universities like Gulbarga U. not have aberrant names for their campuses? At least “Vidyaaranya” for the Hampi campus is imaginative. Mumbai players are India’s Aussie aliases. Gangotri Glades is infact one of the most picturesque stadiums I ve come across which is on the backdrop of Karanaji Kere, very scenic. 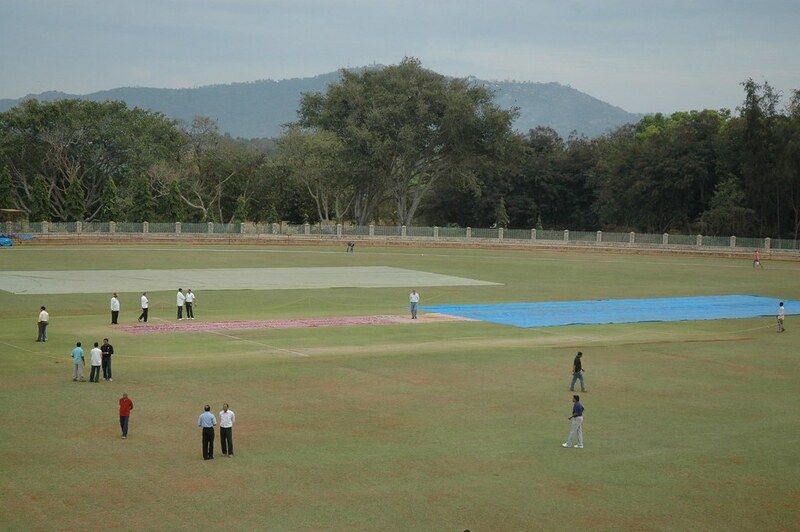 Also for Cricket, it has got good decent facilities for a Ranji fixture. A lovely ground! Is it real? I know of Stadium, Yuvaraja college ground and Philomina college ground, where I have played lot of cricket. In the late 50’s there was a Ranji match in Mysore and I remeber my Brother shook hands with ASK and he kept his hand in his Nikker pocket for two days! It is really nice that Mysore has finally got its place under the sun. Both teams have their star batsmen playing for the country and are more or less evenly matched. They had almost identical victories in the semifinal. One hopes to see a great match worthy of a final. Beautiful ground and a promise of a good match. Time for Bangaloreans to turn green with envy !! btw, how are the venues for Ranji matches chosen? I mean, How is it chosen between Mumbai and a ground in Karnataka? This is a “home” ground for Karnataka and gives an advantage. How is the advantage neutralised for Mumbai? Lovely ground! I just hope even the outfield is good enough for a final (considering the noises made by Mumbai team about its quality). Karnataka has been playing some excellent cricket this season and I would stick my neck out and would say the most worthy team to be in the fianl. Can’t say the same about Mumbai who IMHO have sneaked in after fairly ordinary progress in league phase. But then final is anybody’s game and Mumbai could very well upstage much better team ie Karnataka. I hope the pace trio maintains the great form and Robin, Manish. Ganesh, Amit and Gautam carry on the bat as they have done so far. I followed Karnataka cricket in Ranji after almost 10 years with great interest and a win would be an icing on the cake! what a thankless effort from Hari and his team,wicket at is best,picturesque but the outfield is brown in some places only because KSCA hosted KPL and painted sponsors name.Hope more matches for the youngsters in Mysore and they get more chance in the nets to bowl.